A psychoactive substance is any chemical that, upon consumption, leads to a state of intoxication and alteration of physiological functions. Tobacco is the most common licit psychoactive substances being used globally and is the biggest contributors to mortality and morbidity. Tobacco has multiple effects on the hypothalamic-pituitary-thyroid axis and the functioning of the thyroid gland. 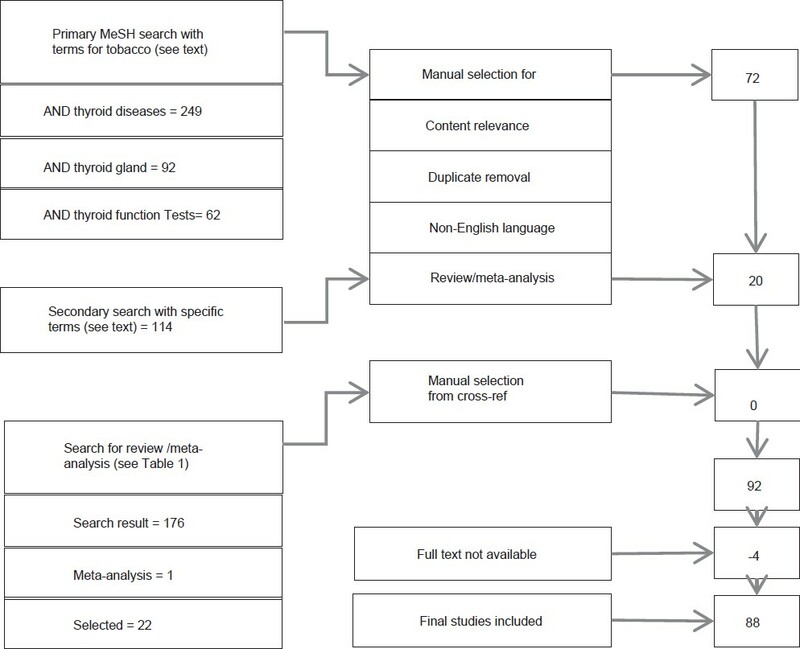 This article presents a review of the clinically relevant effects of tobacco on the hypothalamic-pituitary-thyroid axis. This review mainly focuses on clinical issues. Tobacco smoking modifies almost all functions of the thyroid gland. 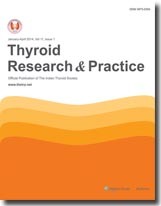 Background: Thyroid Research and Practice (TRP) has been in existence since 2004 and since then it has been working for dissemination of knowledge and research in the field of thyroidology. This work was aimed at performing bibliometric analysis of TRP. Materials and Methods: The publications of year 2006-13 of TRP were analysed. Total number of articles published, type of articles, their authorship, and the coverage of various subspecialties was studied. The publications were also classified as being of Indian or foreign origin and from academic or non-academic institutions depending upon the institution of first author. Results and Conclusions: A total of 23 main issues and 1 supplementary issue were published in TRP in years 2006-13, including a total of 210 publications. Taking collectively, original articles were published in majority. There was a widespread coverage of all subspecialities of thyroidolgy, but maximum number of articles dealt with clinical thyroidology. Publications were largely originating from academic institutions. 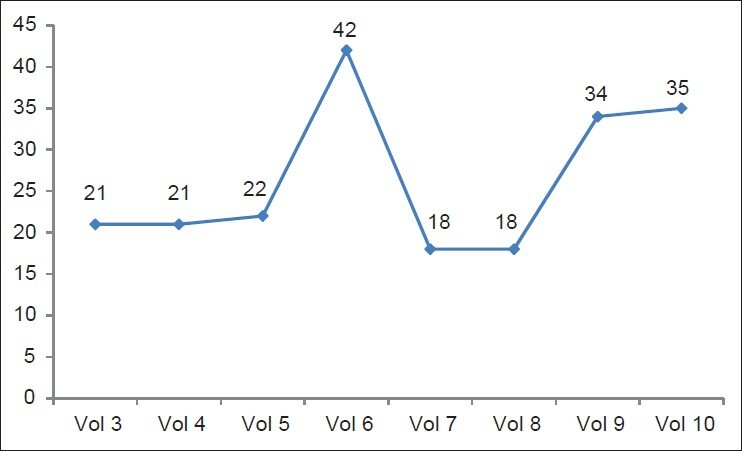 Although maximum number of articles were from India but the publications from other countries are also on an increase. Articles from all parts of the country have been published in TRP, but Kerala has contributed maximally. Objective: To evaluate the effects of cultural beliefs and attitudes on goiter and thyroidectomy and assess their psychosocial and economic implications on patients. Patients and Methods : In a 3-year period, between January 2008 and December 2011, a total of 65 patients were randomly selected and interviewed by using an interviewer administered questionnaire in our surgical outpatient department. Standard expressions and explanations in English and local dialects were used. Results: The patients consisted of 60 females and 5 males with a male to female ratio 1:12. Age range was 20-69 years. Major ethnic groups were Yoruba 60%, Ibo 20%, and Hausa 8%. Most of the patients, 72% believed goiter was caused by poison from witchcraft/devil and only 10% have the true knowledge of causes of goiter. In 60%, the most common psychosocial problem was exploitation by the traditional healers (THs), 15% were withdrawn and 12% were apprehensive. About 88% could not afford surgical bill until 2-7 months after initial hospital attendance. Failure of trado-medical treatment and cosmetics were the reasons for advancement in 44 patients for seeking orthodox medical services. In 16 patients, thyroidectomy was successful because neighbors encouraged them to come to hospital, while in 9 patients, it was a result of health education (HE) from electronic media, and in 3 patients, it was because of toxicity and malignant transformation. Formal education had some influence on the attitudes of patients toward goiter and modified their behavior and cultural beliefs. Conclusion: Goiter is believed by some patients to be one of psychic and psychosomatic disorders as a result of cultural beliefs and attitudes. Hence, trado-medical treatments are sought to cure it to no avail. This eventually inflicts a lot of psychosocial and economic problems on patients. HE and medical services need to be improved upon. Filariasis is a major public health problem in tropical countries, including India. The disease is endemic all over India, especially in Uttar Pradesh, Bihar, Jharkhand, Andhra Pradesh, Orissa, Tamil Nadu, Kerala, and Gujarat. A majority of infected individuals in filarial endemic communities are asymptomatic. Adult worms live in the lymphatic vessels of the definitive host and microfilaria is released and circulates in the peripheral blood. Cases of microfilaremia have been reported from atypical sites like lymph node, pleural and pericardial fluid, breast lump, and bone marrow. We present a case of microfilaria in thyroid fine needle aspiration cytology, which is an unusual finding. Microscopic vascular invasion is well-recognized phenomenon in thyroid cancer especially in the follicular and poorly differentiated histological variants; however, massive tumor invasion of the great veins is very rare. Management of these patients is technically challenging and is further complicated due to lack of evidence-based guidelines. 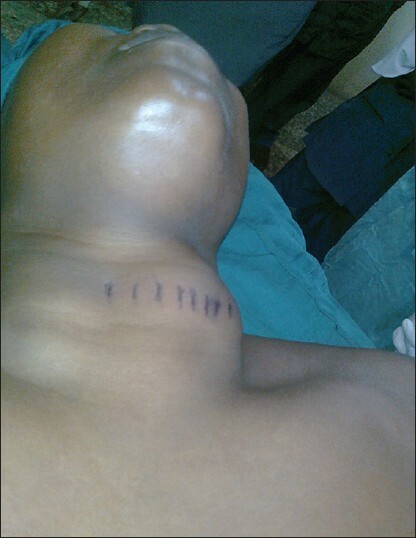 Complete resection whenever possible is recommended by most authors as was successfully done in our patient. With the best available evidence, a multimodality therapeutic approach comprising surgery, radioiodine, and external beam radiotherapy may give the best result for patients in whom thyroid cancer is occluding the great veins. We share our experience of thyroid cancer patient with a massive tumor thrombus involving the great veins of the neck and medistinum. We report two cases of incidental detection of thyroid tissue in ovary. These cases were found in women who underwent hysterectomy for other causes. 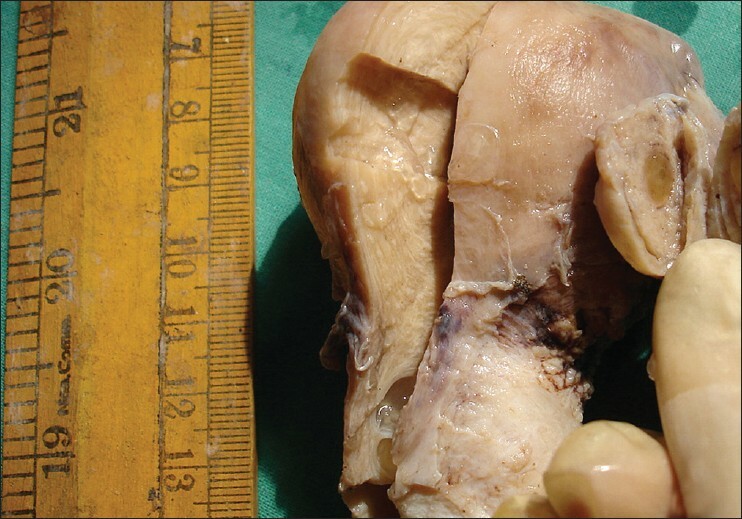 The sizes of ovaries were normal and there was no evidence of teratoma on multiple sections. Pellagra is more common in developing countries than the rest of the world. Malnutrition is more common in these countries; in part because the staple grains do not have sufficient niacin. Classical triad of diarrhoea, dermatitis, and dementia is diagnostic of pellagra. Milder forms can present with slowing of mental functions and skin manifestations can start as dryness of skin Castle's necklace and glove; stocking pattern of dermatitis. 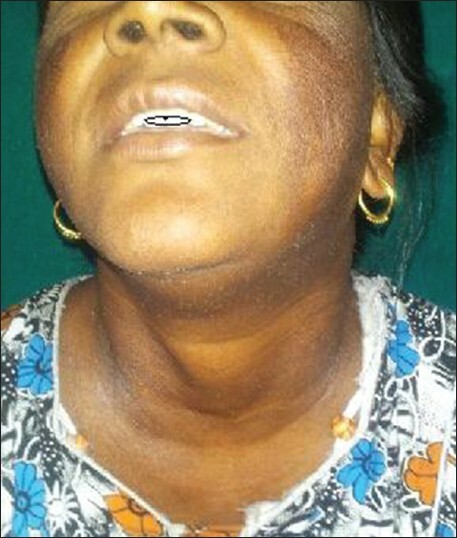 We had a female patient who was operated for thyroid disease in the past but was not on replacement therapy. Hypothyroidism and pellagra were diagnosed to be present simultaneously, which is reported very rarely. Both the conditions presenting concurrently may be incidental or could share the common metabolic pathway for becoming clinically overt. It is difficult to determine if the deficiency of vitamin B 3 which unmasked the thyroid deficiency or vice versa.